Article written by Ching Tien for the EVE webmagazine. In 2017, I visited a rural high school in Gansu, the poorest province in Northwest China. Sitting in a classroom with a group of 30 girls, I posed the question: “How many of your mothers finished elementary school?” After a pause, only one hand went up. If a woman receives an education, her life changes and her children will also be educated. Providing girls with access to education is what I have been doing for the last 13 years. Up to the present Educating Girls of Rural China, which I founded, has supported 842 young women and all their families have been lifted out of poverty. I grew up in Beijing and attended a girls’ school. I studied dance and theater and dreamt of attending the best university and one day becoming a writer. However, my dreams were shattered with the onset of the Cultural Revolution. Instead of finishing school, I worked in a factory for eight years along with my mother, a doctor, who was sent to Gansu Province. In Gansu I witnessed dire poverty and the harsh reality of life for women and girls. Girls were married as early as 12 or 13. Women who failed to give birth to a son were abused, divorced and some even took their own lives because of the shame. These women simply didn’t know that the gender of a baby is determined by the father. When I was in Gansu I felt so isolated and desperate that I could not see any future. I knew I had to leave. Then miraculously I found an opportunity to emigrate to Canada, a place I could never have dreamt of going. At first my life in Canada was not easy either. I struggled in a different way. But the difference was that from this point onwards, every decision was my own. I owned an art gallery and exhibited artworks by some of the top Canadian and international artists. I raised a son and a daughter on my own. Time went by. In 2004 my 14-year-old daughter performed in a benefit-concert for a program in Africa called “Go Girls”. It was at that moment that I felt inspired. Seeing my daughter and other teenage girls on the stage reminded me of my life in rural China, of the girls in Gansu and of the meaning of opportunity. Don’t those young women also deserve an opportunity? As a result, I founded Educating Girls of Rural China (EGRC). Today’s China is a different place. With its fast-paced economic development, over 800 million people have been lifted out of poverty. Basic food and shelter are no longer a struggle, even for people in rural areas. However, many millions of the country’s 1.4 billion population are still left behind, particularly women and girls. The Chinese government provides free education up to grade nine. The cost of one year of high school is about half a poor family’s annual income. Girls are often asked to quit school and go to work to support their male siblings’ education. My work is to provide an education opportunity for these young women and the result has been astonishing! Each of the 842 girls my foundation sponsored has an inspiring story. I particularly remember Wenjuan’s story. Wenjuan was the second of four girls in her family. After the fourth girl (and no boy) was born, their father left. Determined to pursue an education, Wenjuan spent every summer during her high school years working at a brick factory. Eight hours of back-breaking work earned her the equivalent of 2.00 USD in 2008. Her university education was sponsored by EGRC. Now with a Master’s Degree in Economics Wenjuan works at the Bureau of Economic Reform and Development in Ningxia. In 2016 she made her first donation back to EGRC, in order to continue supporting other young girls like her. My relationship with these young women goes beyond the financial sponsorship and continues after their graduation. We provide internships and job opportunities, English and leadership training, and emotional and mental well-being support. Our alumnae are confident young women who have the drive and education to pursue their dreams, and who remain involved with EGRC through donations and mentoring of current students. I can see that some of them are on their way to becoming the future leaders of China and beyond! To navigate the complexities of different social, economic and political structures, it is important to be sensitive and adaptive in establishing policies and programs that are environment-friendly as well as result and impact focused. For me, it is about following my heart and understanding the needs of the people I am trying to help. Reflecting of my own journey, I am proud of my resilience for not letting seemingly impossible situations get in the way of hope. The key is to believe in yourself. Before founding EGRC, everything I did was for one reason – survival. Founding EGRC is a dream. Wholeheartedly and with the same resilience that guided my personal journey, I have been pursuing this dream, one girl at a time. For more than 20 years, Ching owned and managed an art gallery in Vancouver and organised exhibitions for renowned contemporary Canadian artists. She has been actively involved and volunteered at local arts and music communities and acts as the chair of the board of Vancouver Children’s Choir. In 2005, Ching founded the charity Educating Girls of Rural China (EGRC) with the belief that educated women have educated children and that educating women is the fundamental way to build a better society. For the past 13 years, EGRC has worked at a grassroots level in poor rural regions of China through providing financial sponsorship and all-around support to girls with their high school and university education. Ching spoke at TEDx Beijing, JP Morgan’s China’s Philanthropy Today and the British Council’s Inspiring Women event, Girls 20 Summit, Alibaba’s Global Women Entrepreneur Conference, etc. 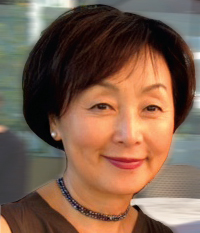 Ching received Canada’s Governor General’s Award in 2017, and is nominated for RMB (Royal Bank of Canada) Canadian Women Entrepreneur Award in 2018.